The menopause life transition strikes during a chaotic time in women's lives: most are in the late stages of their careers and have children old enough to be starting their own families. As if coping with these changes was not enough, menopause brings a host of uncomfortable physical and emotional symptoms, such as hot flashes, night sweats, vaginal dryness, and a low libido.Trying to deal with these menopause symptoms can lead to another common symptom of menopause—mood swings. Fortunately, there are some things you can do to relieve some of life's biggest demands. Read on to learn more. Female hormones like estrogen and progesterone are thought to influence mood through their interaction with the neurotransmitter serotonin, responsible for mood regulation. When hormone levels drop, so do serotonin levels. Beyond hormones, various psychological, behavioral, and health factors can cause mood swings, such as stress, relationship problems, and alcohol use. As a stimulant, caffeine can leave you feeling anxious; conversely, alcohol works as a depressant in the body and can leave you feeling down. 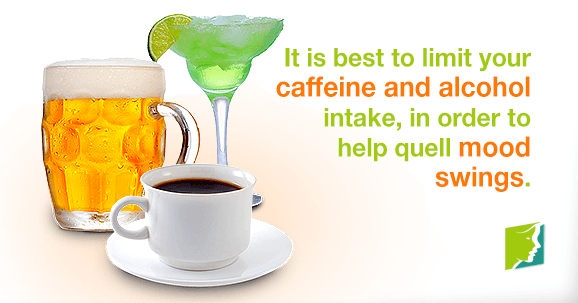 It is best to limit your intake of these beverages in order to help quell mood swings. Sleep disorders are known to contribute to the occurrence of mood swings. Too little sleep can make you feel irritable and fatigued during the day, leaving you vulnerable to mood swings. Make sure you are getting a solid 7 to 8 hours of sleep each night. Mood swings are often due to psychological factors like stress, anxiety, relationship problems, and difficulty coping with change. Talking with your partner can go a long way towards relieving your concerns. You can also turn to friends, co-workers, or an online community to give you the support you need during this difficult life transition. Mood swings are a common symptom of menopause, but in some rare cases they can be a sign of a more serious psychological disorder (bipolar disorder, depression, anxiety) or health condition (diabetes, heart disease, cancer). It's always best to consult with a health care professional to rule out these possibilities. Exercise will not only help improve your overall health and self-confidence, but it can help stabilize your mood. Engaging in physical activity for thirty a minutes a day, five days a week, will reduce stress and anxiety over time. This article provides lifestyle tips to help prevent mood swings. However, it does not address the root cause of the problem: hormonal imbalance. Explore the articles below to read more information about mood swings and how to manage it.